Leeds manager was behind Derby training ground snooping. Leeds boss Marcelo Bielsa has admitted “full responsibility” for the spying incident at Derby’s training ground which left Rams boss Frank Lampard fuming. The build-up to the Sky Bet Championship match at Elland Road was overshadowed after a man was caught outside Derby’s training ground on Thursday. Derbyshire Police were forced to intervene and it was alleged that the man was an employee of Leeds who was spying on their opponents’ preparations. After speaking to Bielsa over the phone, and the Argentinian admitting it in an interview prior to the game, Lampard suggested his club would not be making a complaint and would leave the matter in the hands of the authorities. Asked by Sky Sports if he would be making a complaint, Lampard had said: “I don’t think we need to, because he’s admitted it so it’s easily dealt with. Bielsa had earlier admitted it was something he had done previously but Lampard was not interested in discussing any potential cultural differences which might see such incidents become more frequent in this country. 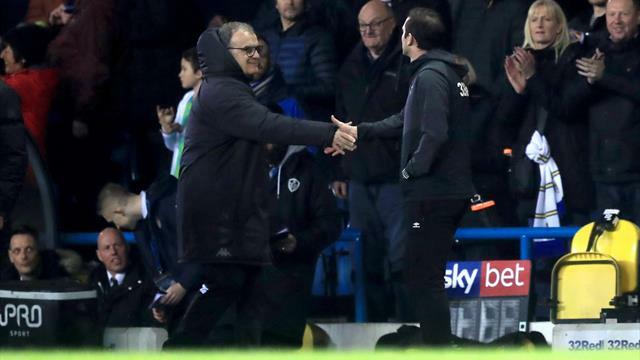 The EFL had earlier released a statement suggesting it was still awaiting an official complaint from Derby, but Bielsa’s pre-match comments could see its stance revisited after he admitted to sending someone to the Moor Farm complex. The Leeds boss said: “It’s true there was someone from Leeds United, the responsibility of this is (down to) me, I am responsible. “It doesn’t matter if this is legal, illegal, right or wrong. For me it’s enough that Frank Lampard and Derby County felt it was not the right thing to do. I didn’t behave well. “Yesterday I talked to Frank Lampard and he told me I didn’t respect fair play. I have a different point of view on it but the important thing is what Frank and Derby think. An EFL spokesperson earlier said: “We are aware of the reports in relation to an incident at the training ground of Derby County. Leaders Leeds won the game 2-0 with goals from Kemar Roofe and Jack Harrison.